Investors are well served when they are reminded of the various risks that come with any type of investing. But they are much better served when they are also provided with tools that allow them to manage or mitigate those risks. Preferred stock investors are often (and correctly) reminded that once interest rates start rising again, the value of their preferred stock holdings will tend to fall (as measured by decreasing market prices for fixed-income securities). This caution, however, is rarely accompanied by an explanation of the various tools that much of this risk can be managed or mitigated. The market price of fixed-income securities (bonds, preferred stocks, etc.) tends to move in the opposite direction of prevailing interest rates. Here's why: when new preferred stocks are introduced, the dividend rate ("coupon rate") that they pay is set such that there is a market (buyers will buy) at $25.00 per share. So let's say you purchase a share of a newly issued preferred stock that pays a 7% dividend for $25. Now a year goes by and rates have risen to, say, 8%. If a new 8% preferred stock costs $25.00, what do you think happens to the market price of the old 7%-er that you purchased a year ago? It drops below $25, of course. Rates and market prices tend to move in opposite directions. The Federal Reserve announced in August that it will not be increasing rates for at least another two years. Thinking ahead a bit here, when the Fed does start raising rates, our economy will be in the early days of what is sure to be a very fragile recovery so any rate increase is likely to be (a) very minor and (b) announced well in advance. This is important to preferred stock investors since the magnitude of any increase in rates is just as important as the direction of the change. If rates go up a minor amount, the resulting effect on the market price of your preferreds would be correspondingly minor as well. Even though we are not expecting to see increasing rates for at least another two years, and even if we do any such increase is likely to be trivial, there are a variety of tools available to preferred stock investors that can help protect your principal. Doing so starts right at the beginning when you are considering new purchases. 1. Invest In The Best: Like many other types of investments, weakening market prices tend to hit the poorest quality preferred stocks harder and more quickly. Investors will tend to vacate their positions in lower quality securities before doing so with those of higher quality. Savvy preferred stock investors can add a layer of principal protection simply by concentrating their holdings on the highest quality issues. The highest quality preferred stocks are those that meet the ten criteria from chapter 7 of my book, Preferred Stock Investing. For example, the highest quality preferred stocks are those that (a) are rated as "investment grade" rather than "speculative" or junk grade; (b) have the cumulative dividend requirement in their prospectus (meaning that if the issuing company skips a dividend payment to you they still owe you the money; their obligation to you accumulates) and (c) are issued by a company that has a perfect track record of never suspending a preferred stock dividend. Invest in the best. 2. Avoid Paying More Than Par ($25.00): Most preferred stocks have a call price (also called a "liquidation preference" or "par value") of $25.00 per share. This is the price that the issuing company will pay you should they choose to retire ("call") your shares (which they regain the right to do five years after the preferred has been issued). Buying shares for less than $25 therefore adds a level of principal protection in the event that the issuing company calls the shares. In the event of a call, the issuing company becomes your ‘built-in buyer’ and you would realize a capital gain. The table seen at right shows you a list of the 21 highest quality preferred stocks trading on U.S. stock exchanges on Friday, December 2 for $25 or less (note that to protect the values of subscriptions to the CDx3 Notification Service, my preferred stock email alert and newsletter service, trading symbols are obscured here). With an average yield of 7%, notice that all offer dividend rates of at least 6.5%. 3. Stay Off The Bottom: Preferred stock dividend rates range from 6% to 9%. Those following the preferred stock investing method described throughout my book, Preferred Stock Investing, avoid issues that pay below 6.5%. As rates bounce off of 6% and start rising, those holding shares at 6.5% will have time to consider selling while the prices of their 6.5%-ers are still above $25. Stay off the bottom by leaving yourself 0.5% of breathing room. Since you always pay less than $25 for your shares, you should be able to capture a capital gain if you feel that selling is in your best interest. Note, however, that by selling you put an end to the dividends being produced by those shares. 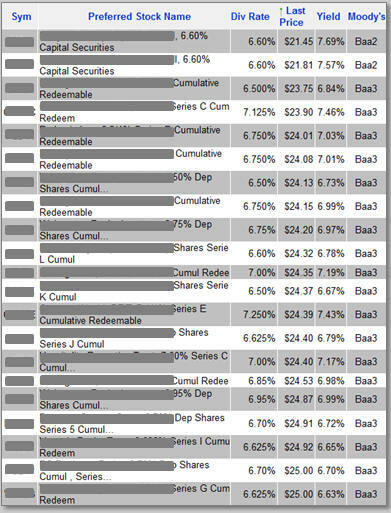 By paying less than $25.00 per share for the highest quality preferred stocks that have a dividend rate of at least 6.5%, preferred stock investors can add several layers of principal protection and prepare their preferred stock portfolios for future rate increases. 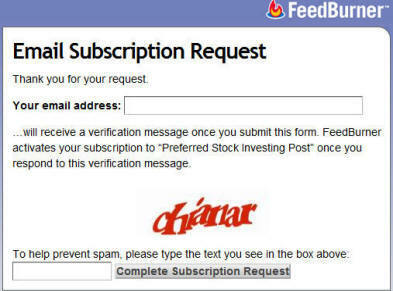 But what about preferred stocks that you already own? Given today's zero-rate environment, we all know that rates are going to start increasing at some point. Even though the Federal Reserve appears content to put off such a rate increase for at least another couple of years, it is never too soon to consider adding more layers of principal protection to your preferred stock portfolio. Lower paying preferred stocks tend to take a price hit sooner and harder than their higher paying counterparts. Using a simple technique called "upgrading," it is possible to trade in your low dividend payers for higher dividend payers and even have cash left over when you are done. Preferred stock investors can use the upgrading technique to prepare for, and stay ahead of, rate increases. And upgrading is very easy to do. All you need to perform an upgrade is a list of high quality preferred stocks sorted by their current market price (highest to lowest). Using the Preferred Stock ListTM tool on the CDx3 Notification Service website, you can produce such a list in one mouse click. For example, a couple of weeks ago owners of VNO-G (which pays a 6.625% dividend rate) could have sold their shares for $25.30 and purchased an equal number of shares of CWH-E (which pays 7.25%) for $24.30. Both have the same investment grade Moody's rating. Upgrading your VNO-G shares to CWH-E would have increased your dividend income by 0.6% with $1.00 per share in left over cash sitting in your brokerage cash account. To see an explanation of this example just click here. A new window will open on your screen with an article that I wrote for the popular investing website "Seeking Alpha." I write for Seeking Alpha throughout the month. To receive an email message when my new Seeking Alpha articles are published just click the Follow button under my phot0 when viewing one of my Seeking Alpha articles. Doing so is entirely free to you. Upgrade opportunities tend to present themselves during stable or increasing rate conditions. Rates have been flat for two years now so there tends to be several upgrade opportunities at any point in time. 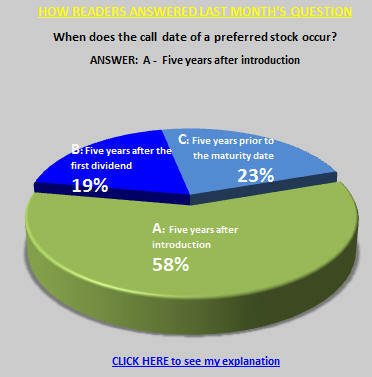 Another important point for preferred stock investors to always remember, especially since interest rates are not expected to change any time soon, is that your preferred stock dividend income is based solely on how many shares you own, not the market price nor your original purchase price. Many preferred stock investors are buy-and-hold investors; they are in it purely for the reliable, fixed dividend income so they see falling market prices as an opportunity to buy more dividend-paying shares. Since they never intend on selling, they do not care about market price fluctuations beyond adding more shares during periods of falling prices. But for those concerned about future rate increases, know that preferred stock investors have several tools available to them to manage and mitigate that risk by adding layers of principal protection as described here. Since the Big Bank Trust Preferred Stock (TRUPS) opportunity was created by the Wall Street Reform Act on July 21, 2010, every issue of the CDx3 Newsletter has allowed readers to watch the opportunity unfold in this article. As explained here for the last 18 months, this opportunity involves identifying Big Bank TRUPS that can be purchased for less than $25, then cashing the great dividend checks while waiting for the Big Bank to call your shares in response to the Act. Section 171 of the Act made it highly likely that Big Banks would do so and that is exactly what has been happening over the last few months. In the event of a call, shareholders receive $25 per share in cash from the issuing bank allowing you to pile a nice capital gain on top of the above average dividends that these TRUPS pay in the meantime. The first Big Bank TRUPS table that was provided to you in the August 2010 issue of the CDx3 Newsletter included 22 high quality preferred stocks that were ripe for picking. If you have taken advantage of this opportunity over the last 18 months, you have done very well. Your effective annual returns almost certainly exceed 8% with many earning well above 10%. Congratulations! But as pointed out in previous issues, as we approach the January 1, 2013 implementation date of section 171 of the Act, the market prices of Big Bank TRUPS will trend toward (and slightly exceed) $25 per share as more investors anticipate these calls. So the list that you have seen here for the last 18 months has gotten predictably shorter. The Big Bank TRUPS table is now down to three qualifying issues and our Big Banks have started calling such securities as predicted here all those months ago. The August 2010 issue of the CDx3 Newsletter described this opportunity as "...probably the single most significant opportunity for preferred stock investors in history" and it has been exactly that. During a time when bank CDs have been offering less than 2%, those taking advantage of this opportunity have made that return several times over. Each month the list of high quality Big Bank TRUPS that are available to be purchased for less than $25 per share has been published here (with trading symbols and descriptions obscured) allowing readers to follow the progress of this opportunity. (Already a subscriber? 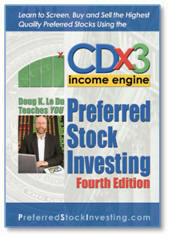 For symbols see page 7 of the December 2011 issue of the subscriber's newsletter, CDx3 Research Notes). What is the difference between a 'cumulative' and a 'non-cumulative' dividend? There were thirteen Big Banks facing bankruptcy during the Global Credit Crisis. These thirteen Big Banks had a total of 70 preferred stock issues trading. 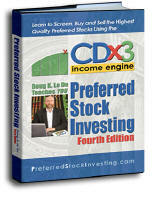 As those 70 preferred stocks were subjected to the ten CDx3 Selection Criteria (Preferred Stock Investing, chapter 7 "Identifying CDx3 Preferred Stocks"), 57 were filtered out as unworthy to begin with while the remaining 13 were of high enough quality to be considered "CDx3 Preferred Stocks" (see sidebar at the top of this CDx3 Newsletter). 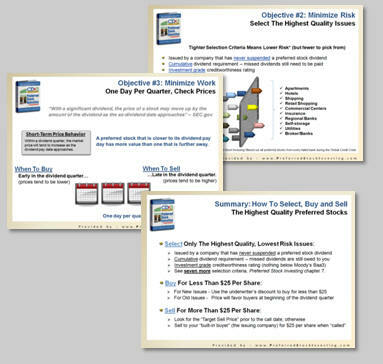 Once the crisis abated and the results were tallied up, we learned that the CDx3 Selection Criteria, originally published in October of 2006, had saved preferred stock investors 100% of the time. In 70 out of 70 cases, the ten CDx3 Selection Criteria eliminated the exact 57 preferred stocks issued by the Big Banks that would fail during the crisis and let through the 13 preferred stocks issued by the Big Banks that were saved (see summary table of results by bank). More than any other single criteria, it was CDx3 Selection Criteria #6 - Dividends must be "cumulative," that was most responsible for saving preferred stock investors throughout the crisis. The question this month for preferred stock investors: What is the difference between a "cumulative" dividend and a "non-cumulative" dividend? (A) A cumulative dividend is one that increases each quarter; non-cumulative dividends stay the same. (B) Cumulative dividends must eventually be paid to you while non-cumulative dividends can be skipped. The correct answer to this question is (B), cumulative dividends must eventually be paid (assuming the issuing company remains solvent). The prospectus of a preferred stock will refer to cumulative dividends in one of two different ways. Most frequently, the term "cumulative" will actually be used in the description of the dividend payments. Less frequently, however, the prospectus, rather than use the term "cumulative" and assume that the reader knows what it means, will use a explanation instead. In this case, the dividends will be described as ones that can be "deferred" (as opposed to being "suspended"). With a cumulative dividend, in the event that the issuing company is unable to make the quarterly dividend payment to you, the dividend will be deferred. The company's obligation to pay you does not go away; they still owe you the money. And until they pay you, no dividends can be paid to common stock shareholders; you get paid first. With a non-cumulative dividend, the issuing company is allowed to suspend your dividend payment. So if they miss a dividend payment to you, you're out. The highest quality preferred stocks ("CDx3 Preferred Stocks") are preferred stocks that carry the cumulative dividend requirement. Interestingly, the 57 preferred stocks issued by the Big Banks that failed during the Global Credit Crisis were all non-cumulative, while the 13 preferreds issued by the Big Banks that dodged failure by being acquired were all cumulative. This question also provides an opportunity to clarify a common misconception. You will often read or hear reference to cumulative and non-cumulative preferreds as being two types of preferred stock. This is incorrect. There are only three types of preferred stock (traditional, trust and third-party trust) as defined by their accounting treatment. Whether or not a preferred stock has a cumulative dividend is a characteristic of the security; it does not define another type (see Preferred Stock Investing, chapter 2 "Creating A New Preferred Stock"). In early November the bank announced that it was going to be "exchanging" certain preferred stocks. They did not say which of their 77 outstanding preferred stock issues would be involved nor did they specify how many common stock shares would be issued. Confusion followed shortly thereafter and, as it turned out later, entirely needlessly. A few days after their confusing announcement the bank issued a whopping 185 million new common stock shares pursuant to this offer, delivering another diluting blow to BofA common stockholders. This after CEO Moynihan's August announcement that no further (value diluting) common stock issuance would be necessary. As there is an enormous amount of sensitivity regarding the future disposition of BofA's Countrywide preferred stocks, many readers asked if the exchange offer involved their CFC securities. Given the level of sensitivity, you would think that the bank would have made it clear from the beginning that CFC preferred stock holders had nothing to fear from this deal since those securities were not involved. It wasn't until almost two weeks later that the bank issued another announcement, just to clear things up. A question here: How many of you can rattle off the CUSIP numbers of your preferred stock holdings? 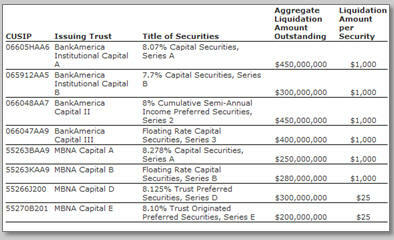 On November 15, 2011 BofA published the list of the eight preferred stocks that were involved in its offer. As you can see here, the bank chose to publish the much awaited list without trading symbols, forcing individual shareholders to figure out for themselves which preferred stocks were actually involved from the CUSIP numbers and short descriptions. The first six on the list are the preferred stocks involved in the exchange for BofA common stock shares. None of these six are publicly traded. Individual investors do not hold these shares so there is no reason for concern with respect to these six (another point that BofA did not mention). The last two on the list were originally issued in 2002 by MBNA Capital and were inherited by BofA as a result of a prior acquisition. Preferred stock investors know these two trust preferred stocks as KRB-D and KRB-E, respectively. BofA wants to modify the nature of the underlying notes held by these two trusts (see explanation of trust preferred stocks and the role of the trust company on page 34 of Preferred Stock Investing) but cannot do so unless a majority of shareholders (for each security) provide their consent. It is this consent that BofA was seeking from shareholders by 5 PM Eastern time on Wednesday, November 21, 2011. BofA is going to pay shareholders who provided such consent $0.0625 per share as a "Consent Fee." For those holding shares of KRB-D or KRB-E, BofA's offer means little more than an easy opportunity for you to pocket a few bucks going into the holiday season. Beyond that, there is no need for preferred stock investors to be concerned about Bank of America's so-called "preferred stock exchange offer." Given the situation this bank is currently in, from a public relations stand point if nothing else, it is amazing that they do not seem to realize what an easy win this could have been for them. Involved In Their "Exchange Offer"